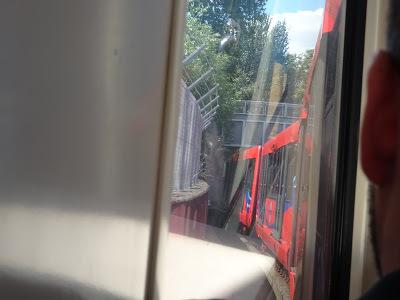 We caught the Heathrow Express to Paddington, yellow line circle line tube Paddington to Edgeware – we had some visitors in the car. 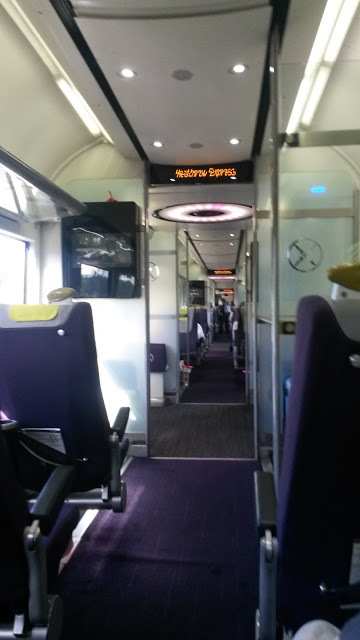 We found our train on the displays in the waiting hall and made our way to the platform – Virgin East Coast 11:20 to Edinburgh was our train got off at the second stop our speed in most areas was 125mph. 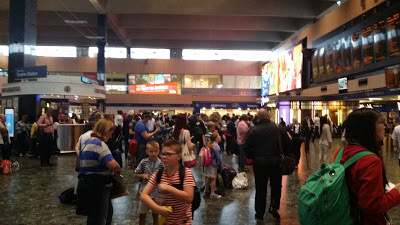 We made our way to Euston Station with all our clobber where I went to get Kaye’s Britrail pass validated at the ticket counter so we could catch the fast train – it was like an airport check-in queue. Whist waiting in the queue I was watching the departures board and noticed a train to Watford Junction – where we needed to go – was on platform 9. So without thinking I took Kaye to platform 9 and without thinking we boarded a London Overground train to Watford Junction. 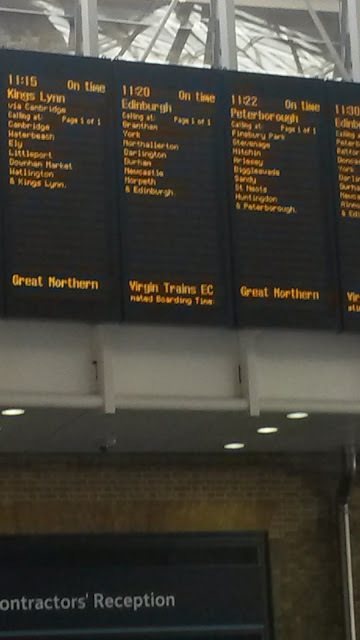 Later I realised that we took the wrong train. 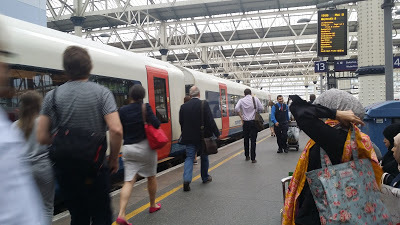 There are three trains London Overground, London Underground and London Midlands fast train – the one we should have taken from another platform. 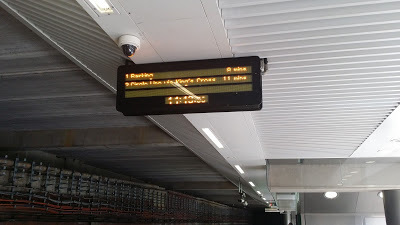 So the 20 minute ride took 50 minutes….. 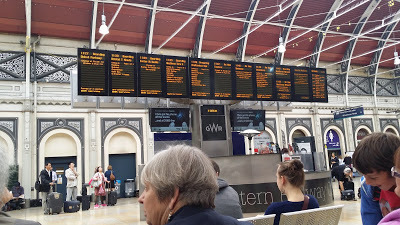 When we got to Paddington we had done our homework so no steps – lift to platform and step free transfers all the way to Stratford. 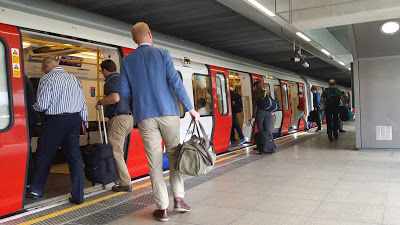 We rode the Docklands Light Rail (DLR) to Greenwich to see the Cutty Sark and take a London Transport River Boat into London. 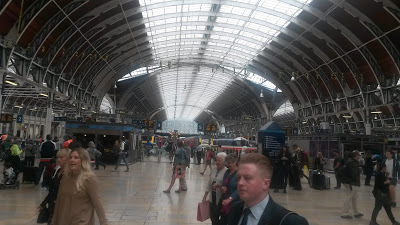 We got to Great Western Railrod platform level at Paddington around 11.10. 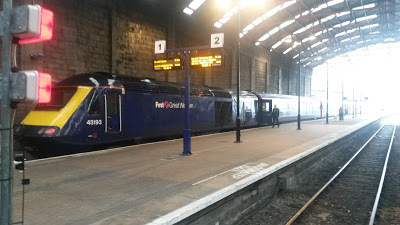 We had planned to get the 12.05 but it was booked out so 13.05 was our train. I took most of the bags to the entry point and when it opened I was the second person to enter our carriage I caused a road block as I had 6 of the 8 bags. Still I got the big ones in the bottom section of the rack so no heavy lifts! 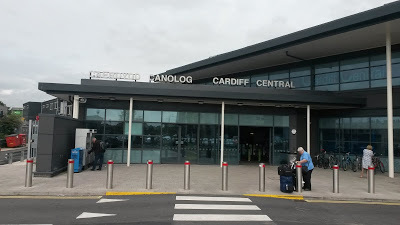 After loading the baggage, I disembarked and stood on the platform till Kaye came along and we both boarded our first class carriage together. The train ride was a pleasant way to spend a bit over 5 hours. I tried some French Syrah/Grenache blend on the train and it was very nice for a young 2015 red. The train passes a number of estuaries on the trip through the West Country. The rain steadily fell during the second half of the trip and we were told by some locals it is affectionately known as “miszle” mist & drizzle. 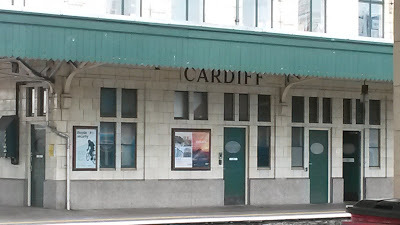 At Cardiff Station where we sat in the first class lounge with a lovely hostess who offered us drinks nibbles and cake and tried to fill our small carry on bags with goodies! 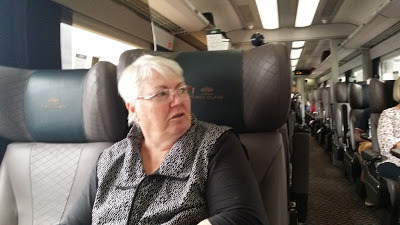 We made use of the WiFi on the train during the trip and even got to speak to our daughter Amy via Facebook Messenger telephone for around 30 minutes – that was really nice. At Stratford Station this time looking for the Jubilee line (platform 13 of 17) to get to London Waterloo Station. 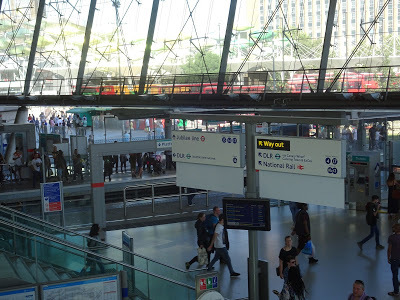 At London Waterloo there were three sets of escalators to get to the Southwest train platforms. 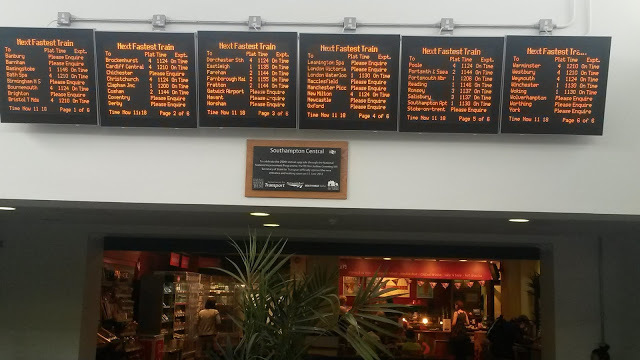 Kaye found our train on the departures board – “Poole platform 8”. Showing our Britrail passes we got on to the platform 3 minutes before departure. The doors in the carriages we tried would not open then I noticed a sign way down the platform – at another train passed the first one and about 300 yards away. The whistles had started for departure I think that they took pity on Kaye hurrying with her walking stick so the train departed about 1 1/2 minutes late. 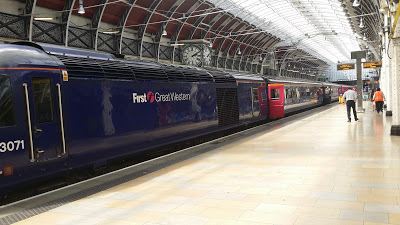 It called at 8 stations before ours Clapham, Farnborough, Fleet, Basingstoke, Winchester, Shawford, Eastleigh, Southampton Airport then Southampton Central where we disembarked. 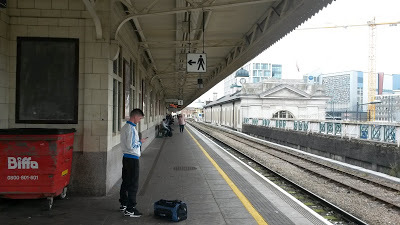 After a day in Southampton we returned to Southampton Central Station where our train arrived within a few minutes for the return journey. I must say First Class seating with a nice French Merlot is just what I needed on the trip back to London. Stratford Station. 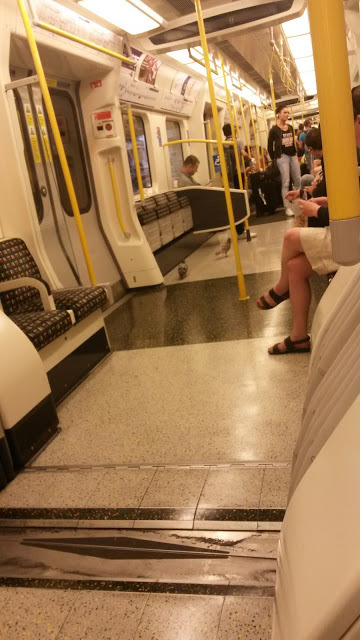 We needed platform 3 – the red Central line. I saw a sign to platform 3 and off we went to the other side of the station in the subway. Well I should have been more careful reading all the signs because at the end of the subway which was around the corner were 3 flights of stairs and no lift – we were in the wrong subway. Turns out that there are 3 subways to the platform and only one has a lift. I carried Kaye’s suitcase to the top of the stairs and as I was about to go back for mine a young man asked if he could help me. I accepted his offer, took two bags off and he carried the suitcase plus my insulin bag up for me. On the platform I put all the bags back together ready to board the train. Well the first train was absolutely packed so no room for 2/3 of the people on the platform. The next one had standing room by the door and we were like sardines in a can – everyone pressed together. 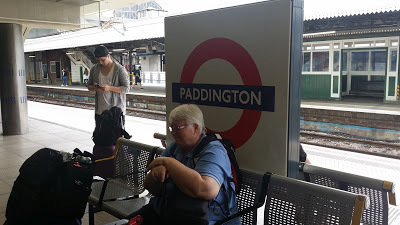 We only had to go to Mile End – the next station – where we changed to the Hammersmith & City line to get to King Cross/St Pancras station. Well I did manage to read the signs right this time so we took two separate lifts to get to street level before the walk between St Pancras and Kings Cross stations. 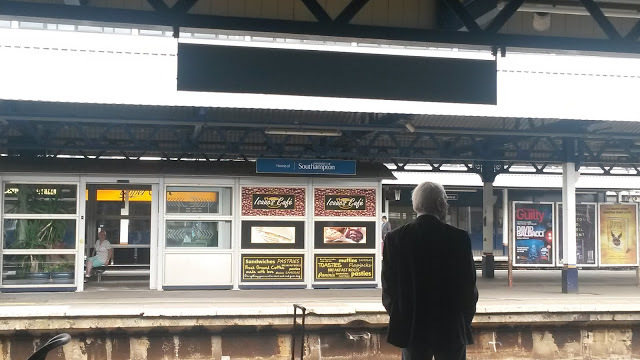 We waited until the platform was announced for our train then went with the masses to platform 1. 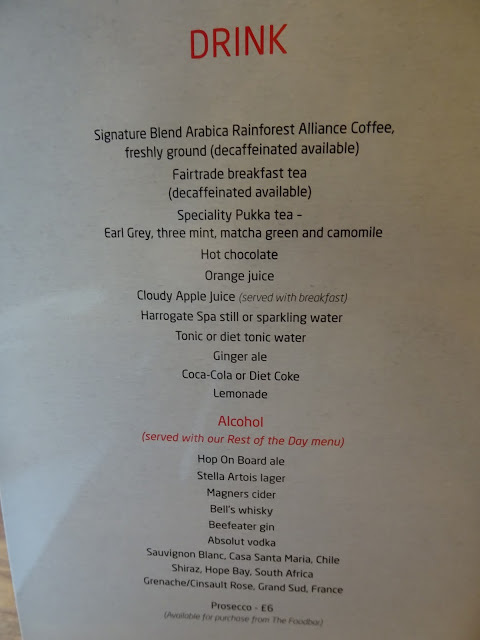 Well our Virgin Trains First Class coach was about half full. Lunch and drinks are provided so Shiraz it was for me and black tea for Kaye. Well I choose chicken curry and I must say that I could have eaten a second plate as it was delicious. Kaye had the sausage roll and whilst it looked, and Kaye thought it tasted yummy, I reckon I got the better lunch! 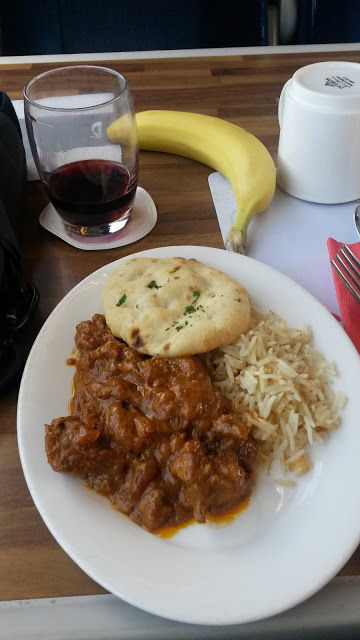 The second glass of Shiraz was drunk as we passed through Doncaster. The train seems to be doing about 120mph most of the time. The third glass after we left York and at least my tummy is holding together today unlike yesterday. The fourth glass at Newcastle on Tyne.